Staining wood seems pretty straightforward: what can be simpler after all than wiping on some colour over wood and then wiping it off? However, even this apparently simple procedure could be devilishly frustrating at times. I have often looked at my attempts at finishing with unreserved horror, wondering how to get rid of unseemly blotches, inconsistencies and so on. So let me recount some of the pitfalls of wood staining and hopefully guide fellow woodworkers away from them. Perhaps the most difficult part of staining is to get the exact colour one if after. 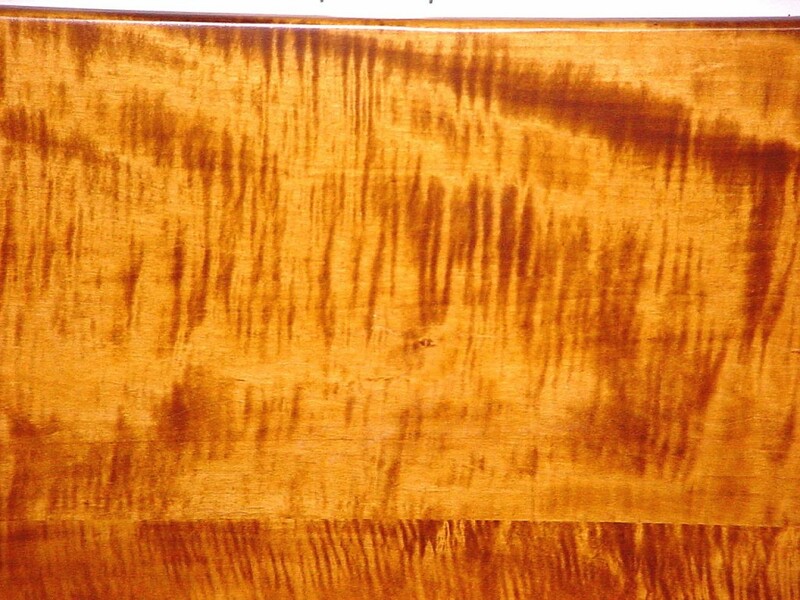 Perhaps you have seen a beautiful piece in a magazine and wish to reproduce it exactly as well as match the finish. Matching the tint can often be the most difficult part of the project and usually you will have to settle for one that looks close to the original. Most pieces are usually stained some hue of brown – walnut, teak, rosewood and so on. Some tints have a reddish hue while others veer towards yellow. Some are dark, others light. The variations are practically infinite and frankly unless you are a bit of an artist colour matching can be a very tricky business. Beginners would be best advised to stick to a standard commercially available tint. Choose one that closely matches the tint you desire and stick to it. Do not attempt to mix colours; and if you do, make sure there is enough of the mix to complete the project because you are unlikely to get the exact same shade again. So, if it is dark walnut of a particular brand that you have chosen, stick with that for your project. Do not trust the tint displayed on the bottle or can of stain. For, the final hue of any stain will depend on the wood it is applied on. Different woods will stain differently and produce very different tints. Even different makes of plywood will stain differently; do not even attempt to stain particle board. MDF, however, can be stained and finished rather well. The most prudent procedure would be to test the stain on a piece of scrap wood of which the project is made. If the colour looks right, go ahead otherwise do a bit more of experimenting until you get the desired result. The strength of the stain to be applied is a personal choice and can depend greatly from project to project. A particularly beautifully grained wood normally would call for a light stain whereas other, perhaps heavier pieces might need a heavier stain. Too much stain might completely ruin a project and would be tantamount to painting it with pigment rather than staining it. Therefore, generally a light hand is called for. Apply your stain diluted and at one go. If the piece to be stained is large or complex, approach it part by part, one wipe at a time. I find oil based stains easier to work with as one can wipe it off, let it dry and then give it another go till the colour reaches the desired intensity. Stain can be lightened by rubbing it over with spirit. The aim would be to cover the entire piece with a consistent stain of the desired intensity without obscuring the grain. A very good way of applying stain consistently would be with a spray gun. Thin coats of stain could be applied evenly over the piece till the desired tint and intensity is achieved. Unfortunately, for most hobbyist woodworkers like myself, the spray option is ruled out because of the expenses and space requirements. A spray gun needs an air compressor and a properly ventilated spray box for safety and cleanliness. At times, even if the stain has been applied carefully and consistently over the wood surface, blotches, light spots and other imperfections could appear. Unless corrected these blotches could completely ruin the appearance of the finished product. For a good looking finish, the stain should be consistent over the entire piece. Light spots could appear because of residual glue, wax, silicon, indentations or hard spots in the wood. If left untouched these spots will stand out after finishing and produce a horrible effect. The remedy is to sand the light areas lightly and re-stain to match the surrounding areas. Blotches could be caused by improper staining, i.e. too much stain in one area or because of the wood itself. End grain, knots and soft parts of the wood are more porous and therefore soak in more stain. This is a major problem with staining soft woods like Pine but could also affect other fairly hard woods like Rubber and so on. The best way to prevent blotching is to either apply a wood conditioner or a thin wash coat of Shellac before staining. Diluted Shellac (roughly 10 to 20 per cent strength) is my preferred solution as it thinly coats the surface, dries quickly and blocks the porous areas to some degree. Conditioners are useful when working with oil stains such as Varathane but take time to dry and might not be as effective as diluted Shellac. Another method is to apply a highly diluted solution of common white glue (PVA glue) to the wood surface. But this method is a little tricky and if the glue solution is too thick then no stain will adhere. If blotching has already occurred, it could be corrected by light re-sanding or wiping the stain away with alcohol or spirit. The area should then be carefully re-stained to match the general consistency of the stain. Another major problem with staining could appear at the stage of applying the finish. At times, the colour will bleed into the finish, leaving blotches and light areas. This is difficult to rectify and it is necessary to experiment with combinations of stains and finishes. I had a major problem with bleeding when I put the first coat of varnish over a piece of plywood stained with an alcohol soluble dye. The dye leached into the varnish and its reddish hue turned orange. 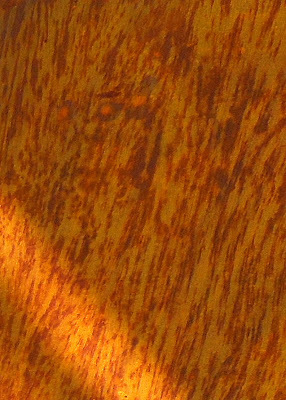 The stain also lightened in parts and the whole piece of wood looked awful. The problem I realised was that the stain dissolved into the varnish; commercial stains in contrast have a binder that makes the pigment stick to the wood so that subsequent coats of finish do not re-dissolve them. But raw stains and dyes tend to bleed colour. I could think three ways to avoid this. The first would be to apply a thin wash of Shellac carefully and quickly over the stain to seal or bind it to the wood. Again this would be best done with a spray gun because even a light wiping action with Shellac would lead to some of the stain coming off. The other solution would be to use incompatible stain-finish combinations. Thus if an oil or varnish finish is to be applied, the stain should be water based and conversely if a water based finish is to be used, the stain should be alcohol or oil based. Even then some amount of bleeding will take place as bits of the dried stain particles will loosen and mix with the finish when it is being wiped or brushed on. The third method, and my preferred one, is to mix the pigment or dye with Shellac to the desired strength and then wipe it on. The Shellac acts as a binder and subsequent coats of finish do not cause anything more than minor bleeding. Staining wood is easy but could lead to unexpected problems some of which could be extremely difficult if not impossible to correct. Often there are no ready or perfect solutions to problems. Experience is always the best guide and testing first is the best practice. Hi . i want to experiment with staining a wooden side table,. i dont know where to start getting the stains and the required conditioner or products. i live in mumbai. Vivek: Rubber wood does not seem to take stain very well. I would recommend first applying a wood conditioner, which is basically a very thin solution of boiled Linseed oil in what Americans call Mineral Oil (some sort of spirit, I guess). This is not easily available in Indian markets but Rustoleum sells it in India. Alternatively, apply a very thin diluted wash of Shellac before staining; this should prevent blotching. Also dyes work better with Rubber wood but you have to be careful in applying it. After staining, apply a coat of Shellac. Melamine over that should not be a problem though I have not tried Melamine myself. Can i apply wood stain on wood primer? Hi, i want to apply water base stain with melamine. I could not find the conditioner and stain in india. Can you help me. You will have to try the local paint shops in your area. Your replies are useless as they do not provide any specific advice on what products in staining would work in the Indian market. Am trying to stain a imperfect wood desk in my home but am utterly frustrated trying to find the exact materials to use. Most of the Us sites are very detailed and helpful, except for the materials they recommend, which we cannot source locally. Having an India DIY blog would really make one think, "hey, this is where my search ends". But unfortunately not from the information you have provided in your blog. Am sorely disappointed. I am polishing a teak wood french door. For a shiny finish I plan to sand till 220 grid sand paper, then put a coat of grain / pore filler and then sand with 300 grid and apply danish oil stain of 5-6 coats and finish with seal coat. will this work, also is there any local brand similar to water soluble timbermate wood pore filler available in India? If so which brand and how / where I can find them? Personally I am against oil finishes as they are not enduring. If you wish to bring out the figure in the Teak, why not apply a wash of Paraffin Oil and then coat with Shellac after it dries. What do you mean by a seal coat? There are many wood pore fillers available but I find they are mostly made by local manufacturers. Fillers like Timbermate even when coloured to match Teak dosn't look good, in my opinion. Nothing to beat Pumice Powder or plain old Chalk Mitti worked slowly little at a time into the wood. Again I would go for a couple of coats of Shellac on top to seal the wood and finish with 3/4 coats of gloss Poly. After sanding, to fill the pores its suggested to use chalk powder, how do we use it? what is the binding agent? Here you are suggesting Shellac as the sealer, the same will be used to polish? I will try to get the dewaxed shellac from Bangalore and follow the steps mentioned in your other blog post. I have a cot made and planning to finish myself, a workable set of steps with materials would help me a lot. Pore filling methods are varied. About 9/10 coats of Shellac should seal most porous wood surfaces. Sand with 320 and 400 grit between coats of Shellac. Another 7/8 coats should give you a good finish. Rub this down with 0000 steel wool or Pumice powder. Final apply paste wax, let dry and buff.